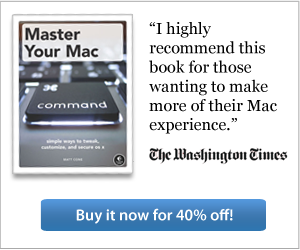 Before you do anything else, you should find the images that you want to use as wallpaper. If you'd like to use images on the Internet, see our tutorial about downloading an image to your iPhone. Using a photo is even easier. Just take a picture with your iPhone - you'll be able to select it in the next section. A word of warning: Finding the perfect wallpaper for your home screen can be a challenge, in my experience. If you pick an image that's too busy or bright, you'll have trouble seeing app icons. But if you pick an image that's too dull or subtle, it'll look boring. Try a variety of images to find the perfect match! 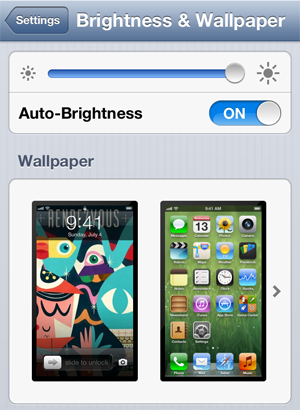 Tap Brightness & Wallpaper. The settings shown below appear. Tap the wallpaper images. The settings shown below appear. 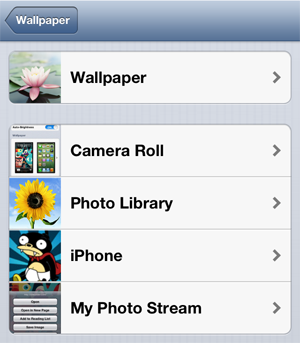 Now you need to select the photo album that contains the image you want to use as your wallpaper. By default, every iPhone comes with a couple images that can be used as wallpaper - you can access those by selecting Wallpaper. We'll use that album as an example. Note: The custom wallpaper images you download to your iPhone or upload from your Mac will not be stored in the Wallpaper album. Those are stored in the Camera Roll album. Tap an image to select it as your wallpaper. The window shown below appears. If you selected a photo, you can resize it with your thumb and index finger. Tap Set. The window shown below appears. To use the image as wallpaper for your lock screen, tap Set Lock Screen. 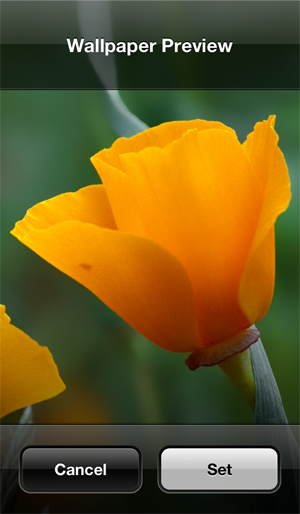 To use the image as wallpaper for your home screen, tap Set Home Screen. 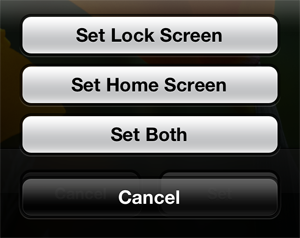 To use the images as wallpaper for both your lock screen and your home screen, tap Set Both. Congratulations! You have successfully changed your iPhone's wallpaper.